In this post, we will talk regarding Installing Exchange 2016. This is 2 part post, in part one, we will talk regarding "Requirements and Prerequisites". Active Directory forest The Active Directory forest functionality level needs to be at Windows Server 2008 or higher. Once the Hardware and Software requirements are in place we are ready to install the pre-requisites. We need the latest version of .Net . 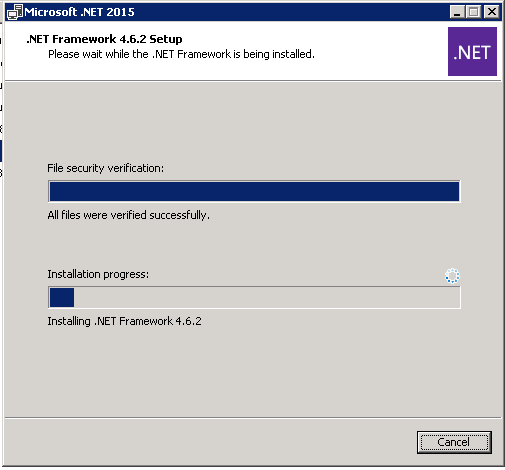 I had installed .Net 4.6.2. We can just install the Remote Server Administration like shown below if we just want to install the Mangement tools. "Install-WindowsFeature AS-HTTP-Activation, Server-Media-Foundation, NET-Framework-45-Features, RPC-over-HTTP-proxy, RSAT-Clustering, RSAT-Clustering-CmdInterface, RSAT-Clustering-Mgmt, RSAT-Clustering-PowerShell, Web-Mgmt-Console, WAS-Process-Model, Web-Asp-Net45, Web-Basic-Auth, Web-Client-Auth, Web-Digest-Auth, Web-Dir-Browsing, Web-Dyn-Compression, Web-Http-Errors, Web-Http-Logging, Web-Http-Redirect, Web-Http-Tracing, Web-ISAPI-Ext, Web-ISAPI-Filter, Web-Lgcy-Mgmt-Console, Web-Metabase, Web-Mgmt-Console, Web-Mgmt-Service, Web-Net-Ext45, Web-Request-Monitor, Web-Server, Web-Stat-Compression, Web-Static-Content, Web-Windows-Auth, Web-WMI, Windows-Identity-Foundation, RSAT-ADDS"
Post installing the pre-requisites we are ready to prepare the domain for Exchange 2016 Installation. For testing purpose, I prepared the domain and AD using Exchange 2013 installation bits and later used Exchange 2016 bits to perform the same steps to see if we are getting any error. We were not getting any error as expected. Also if in your org you don't have Exchange 2013, and you might need to bring in Exchange 2013 at some stage then its required to have a install of Exchange 2013 with all roles in it. 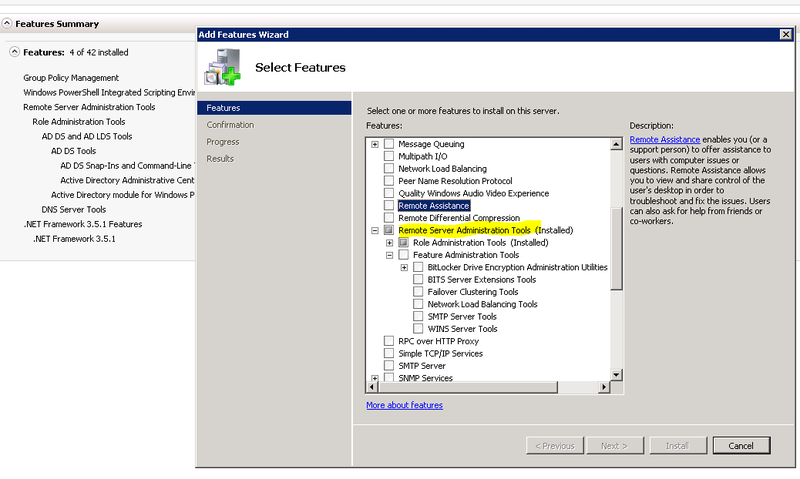 If Exchange 2016 is installed in a environement where there is no Exchange 2013 then at later stage we might not be able to install Exchange 2013 in that environment. 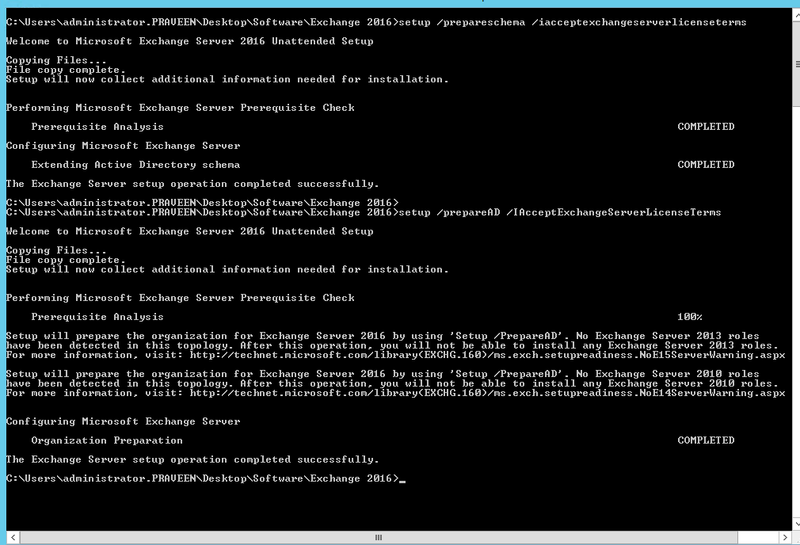 Now we are ready to install Exchange 2016 in our environment. In part 2 we will cover that.